Ivo van Hove loves the video camera. In last year’s dramatization of Bergman’s Cries and Whispers by the Toneelgroep Amsterdam, of which he is general director, the dying sister records her own death. In Roman Tragedies, the adaptation of Coriolanus, Julius Caesar and Antony and Cleopatra, which just concluded a short run at BAM, he takes his preoccupation with a culture fixated on recording itself to new heights. 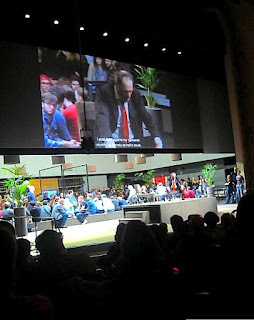 The audience freely wanders onto the stage which is filled with video monitors while those who remaining in their seats are always guaranteed at least one degree of separation from the drama by watching the videography (which now includes their confreres) on a scrim. Audience members are also free to tweet (with computers provider especially for the purpose) and naturally to photograph the production and one another. Competing with the Shakespeare are current news stories which also play on the monitors—Hurricane Sandy, the Gaza situation, the Olympics—and itinerant televised events such as, for example, a number of Manny Pacquiao fights (van Hove is obviously a fan). The Roman Tragedies is techno-cubism and it bears a resemblance Marianne Weems’ House/Divided which recently played at BAM and which toggled between The Grapes of Wrath and the Bank of America/Country Wide Financial scandal also by using video projections. Cubism created a visual synchronicity with perspective eschewed and visual imagery given equal valence on a flattened plane. Techno-cubism similarly democratizes its palette of information. History and culture are all digitalized and turned into bytes that compete for our attention and the major criticism of the production might be that Shakespeare gets bumped by more arresting bits of news. Jan Kott wrote a book called Shakespeare Our Contemporary which influenced famous avant-garde productions in the 60’s and 70’s. Roman Tragedies is Shakespeare Our Contemporary to the tenth power. And there are times amidst all the sound and fury of actors mixing with audience members on stage and leering at violent outbursts the way people stare at accidents that you long for an old fashioned proscenium in which the words and poetry of Shakespeare don't have to compete with all of recorded history. Van Hove makes the audience a part of things, but there is a curious disconnect which might be explained by the rarefied opportunities for catharsis.